Use the day to celebrate all the ministries of the church and all the lay people who share in those ministries. Invite everyone to wear the color Red (the liturgical color for Pentecost). One way to “enter into the story” that is recalled in 1 Corinthians which lists the gifts of the Spirit is to invite people at an appropriate point in the service to stand in groups of three or four to tell one another, succinctly, how God first revealed his gifting of them. This may seem to be a somewhat noisy suggestion, but it will reenact something of the release of the Spirit's empowering grace in the congregation. Offer an opportunity for individuals to respond to their ministry callings and giftings. Facilitate a spiritual gifts assessment in the month of May as part of your Christian Education efforts and pray with individuals to encourage them to remain open to God’s direction. Also, provide general written information such as characteristics and skill-sets that are in line with various giftings. People really want to work in the Church and their community but may need direction to help them settle into the best area of ministry work for the current season of their life. Choir (Sung): Every time I feel the Spirit moving in my heart I will pray. except by the Holy Spirit. and there are varieties of services but the same Lord. Group 1: To one is given through the Spirit of utterance of wisdom and to another the utterance of knowledge according to the same Spirit. to another gifts of healing by the one Spirit. to another the discernment of spirits. obey the Spirit of the Lord. (c) Lord, Help Me Keep My Yes. By Lewis T. Hilton, Jr.
(a) Miracles. By F. Offard and R. Walters, Jr.
(c) Let the Flame Burn Brightly. Words and Music by Ed Rush. Arr. by Lloyd Larsen. (a) Use burnt orange and red to represent the variety of gifts God has given. (b) Use pictures of various ministry activities for screens, bulletin covers, etc., to represent the various gifts of the Holy Spirit. Jones-Moffett, Sheri. Renewed. New York, NY: EMI, 2009. Bridgeman Davis, Valerie and Safiyah Fosua, eds. The Africana Worship Book: Year A. Nashville, TN: GBOD Discipleship Resources, 2006. p. 132. Norwood, Dorothy. Stand on the Word. Jackson, MS: Malaco, 2004. God Can Do Anything. Crockett, TX: OverBoard Records, 2009. Hilton, Bishop Bobby & Word of Deliverance Mass Choir. God Did That Thing! Forest Park, OH: BVHilton, 2009. Trotter, Bishop Larry T. & The Sweet Holy Spirit Combined Choirs. Bishop Larry Trotter & Sweet Holy Spirit (Live). Indianapolis, IN: Tyscot, 2009. Wilson, Generald & the F.A.M. I Live to Praise—I Live to Worship. Florissant, MO: Generald Wilson & the F.A.M., 2009. Huff, George. Miracles. New York, NY: Word Entertainment, 2005. Levar, Kevin & One Sound. Let’s Come Together. Baltimore, MD: Habakkuk Music, 2008. McClurkin, Donnie. Donnie McClurkin Again. New York, NY: Verity, 2003. Kenoly, Ron. Lift Him Up. New York, NY: Sony, 1997. David Crowder Band. Remedy. Roswell, GA: Six Step, 2007. Williams, Lee & The Spiritual QC’s. So Much to Be Thankful For. Alpharetta, GA: MCG Records, 2009. God’s Image. GI—God’s Image. New York, NY: Worldwide Music, 2009. Thigpen, Dathan & Holy Nation. Get Up, Vol. 1: Get Exposed to Unadulterated Praise. Jackson, MS: Dominium Entertainment, 2006. McDowell, William. As We Worship Live. New York, NY: Koch, 2009. Music Book, Volume 1. Rochdale Village, NY: Psalmist Music Group, 2008. Joubert, Joseph. Total Praise. Chicago, IL: GIA Publications, 2009. Heaven. 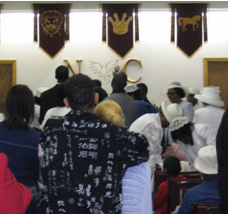 Miami, FL: Blessed Hope, 2006. Textures. Brentwood, TN: Sparrow, 1987. McClurkin, Donnie. Donnie McClurkin, Again. New York, NY: Verity, 2003. Holder, Mel. Music Book, Volume 1. Rochdale Village, NY: Psalmist Music Group, 2008.